Stocks sliced through 2,100 support and didn’t stop until they fell well under the 50dma. The only positive is a late bounce kept us from closing at the lows. Volume was well above average and the highest in over a month. Thursday’s move looks intriguingly similar to April 17th’s dip under the 50dma. That’s good news for bulls because we bounced back above the 50dma the next day. Will history repeat itself? We’ll know the answer by Friday’s close. It’s funny how pundits and gurus claimed a strengthening dollar and falling oil prices were threatening S&P500 earnings. Today the dollar tanked and oil surged. Following their logic, stock prices should have jumped higher today. Shows what the “experts” know. The problem with this market isn’t technical or fundamental, like always, it comes down to supply and demand. Or more specifically today, the lack of demand. Few are willing to buy stocks above 2,120 and we’ve stalled at that level three times in recent months. When no one is in the mood to buy, it doesn’t matter what the fundamentals and technicals are. Where do we go from here? While a lack of demand keeps us from breaking 2,120 resistance, we’re seeing a similar but opposite dynamic happen every time the market dips. Confident owners are completely uninterested in selling regardless of headlines or price volatility. When no one sells, prices bounce on tight supply. That is what saved us April 20th and we’ll see if owners are just as stubbornly confident Friday. As for how to trade this, we slipped back into the middle of the 2,050/2,120 trading range. That leaves us with a fairly balanced risk/reward. But we’re not looking to trade a coin-flip, we want the odds in our favor. That means waiting to see what happens next. Strength on Friday tells us stubborn owners are winning and their refusal to sell will keep a floor under this market. However, nothing shatters confidence like a plunging prices. Another ugly day could easily push us down to 2,050 support. My gut tells me it won’t be as easy this time and we will probably see another leg lower before the selling exhausts itself. Stocks failed to hold yesterday’s gains following disappointing GDP that revealed first quarter growth was practically nonexistent. Volatility was compounded by the Fed’s afternoon policy statement. Despite these headlines and a surge in volume, we traded inside yesterday’s intraday range as the market continues searching for direction. If anyone was surprised by this lack of a reaction to the Fed’s policy statement, they should read last night’s post explaining why it wasn’t a big deal. 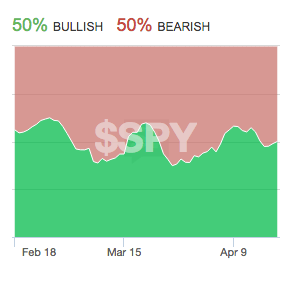 While there was a plethora of headlines to digest today, most bulls and bears stubbornly held their prior outlook. When no one changes their mind, prices stay where they are and is why we ended pretty much where we started. So where do we go from here? We’re near the upper end of 2015’s trading range. Either we bump our head on the ceiling again, or finally break through and start the next rally leg. The dig against the uptrend’s continuation is while we recently set new highs, they failed to trigger wave of breakout buying and short-covering. If we were poised to explode higher, it would have happened by now. Eliminating “up” leaves us with down or sideways. Either way, expect near-term weakness as we slip back into the trading range. The difference will come later when we test support and either bounce, or not. Aggressive traders can lay on a near-term short, but collect profits early and often because this choppy market takes profits back as quickly as it gives them. If you enjoyed this article, sign up for free email alerts and be notified when new articles are published. The difference a day makes. Monday we opened strong, yet crumbled into the close. Tuesday we fell sharply in the first hour of trade, but bounced decisively into the green by the end of the day. This is the definition of erratic and indecisive. 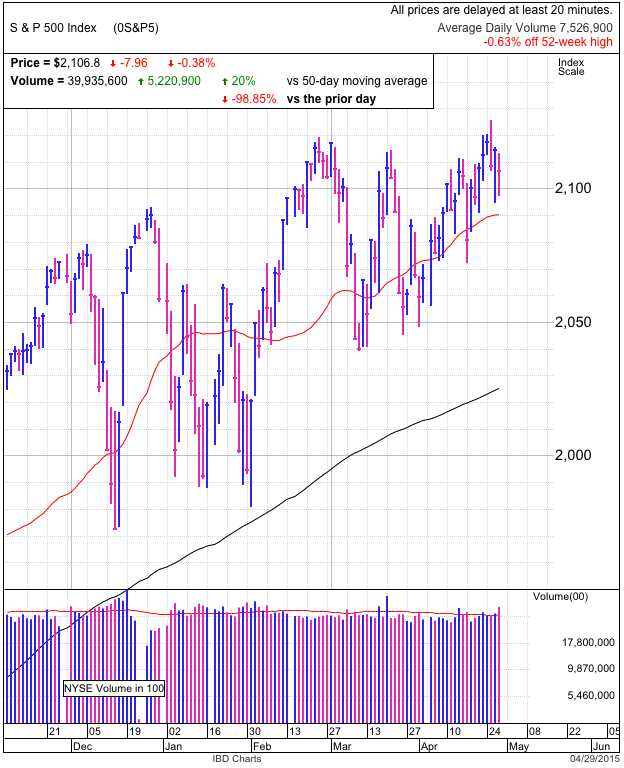 Bulls are pleased we bounced off of the 50dma and found support at 2,100. The morning’s 15-point plunge got everyone’s attention, but it wasn’t enough to rattle owners’ confidence and they continued holding despite the volatility. No matter what is going on, when owners don’t want to sell, we run out of supply and bounce. Clearly that’s what happened today. The challenge for the speculator is figuring out what comes next. Monday’s implosion from all-time highs was ominously bearish. Yet today’s decisive rebound off of support is reassuringly bullish. The reason this market isn’t going anywhere is because no one is changing their mind. We rally when bears warm up to the market and buy it. We selloff when bulls get nervous and dump stock. When both sides are equally stubborn, we don’t go anywhere. While there is a lot of noise this week regarding the Fed’s monthly meeting, using recent history as a guild, it seems highly unlikely bulls will sell the headline or bears will buy the news. This is a stubborn bunch and most likely it will take something new and unexpected to break this logjam. When and which direction is anyone’s guess, but until then keep buying weakness and selling strength. If you enjoyed this article, sign up for free email alerts that will notify you of future posts. Are We Poised to Explode Higher? Stocks notched record highs in early trade, but few bought the breakout and we slipped into the red by lunchtime. This is the third day in a row we struggled with 2,120 resistance. The problem for bulls is if the market was poised to explode higher, it would have happened by now. If the market is not a coiled spring to the upside, that leaves us with two alternatives. Either it is a coiled spring waiting to launch us lower. Or the market is unsprung and not particularly inclined to go in either direction. Just over a week ago we had a steep selloff that sliced through the 50dma. If the market was vulnerable to a selloff, that would have been more than enough to trigger a multi-day decline. But it didn’t. That means we find ourselves in a situation where few want to buy the breakout, but just as few are interested in selling the dip. It seems our spring is unsprung. And that makes sense. We’ve been trading sideways since the start of the year. We run out of buyers above 2,100 and selling dries up when we dip under 2,050. Given today’s weak price-action after testing upside resistance, it looks like the pattern is continuing. The more interesting test will come when we retreat to 2,100 and the 50dma. Can we find support at the upper end of the trading range? If so, that suggests we inch higher from here. While not as exciting as exploding higher, it pads the trading account just the same. But if we cannot hold these technical levels, a dip to 2,050 seems inevitable. Given the risk/reward of inching higher versus a 50-point selloff, this could be a good place to try a quick short. Enjoy this post? Sign up for free email alerts and be notified when analysis is posted. Who is Wrong, Bulls or the Bears? Stocks rebounded following early weakness and are within a dozen points of all-time highs. Bears have a million reasons prices should collapse, but the market doesn’t care. That leaves us with only two possibilities, either bears are wrong, or the market is. Since people love to argue with the market, I’ll start with reasons why it could be wrong. Independent markets are surprisingly efficient even if the participants are irrational. When traders arrive at their opinions independently, one irrational bull is canceled out by an equally irrational bear, leaving us with an astonishingly accurate mid-point. But the key is independent. The system breaks down when groupthink creeps in and skews the results one way or the other. Bubbles are perfect examples of self-reinforcing groupthink on one end of the spectrum. This is the classic, “Their logic seems suspicious, but they’re making money so I’ll follow them anyway.” When enough people suspend their disbelief, we lose independence and the validity of the underlying price. On the other side, how could bears be wrong? What if instead of evil “market manipulation”, a poor understanding of how markets work is causing bears to lose money? What if the market already fully factored in all of their criticisms and this is the price it arrived at because of, not in spite of, these flaws. Maybe we would be higher without these looming structural problems. Many of these criticisms are recycled headlines that have been around for months, if not years. As a general rule of thumb, if average traders are talking about it, then we can safely ignore it. So which side is right? Why not both? In the market, being right isn’t good enough. In fact, the only thing that matters is timing. Having done this for long enough, I’d gladly take good timing over being right every day of the week. And so back to the question, most likely both sides are right, but over different timeframes. 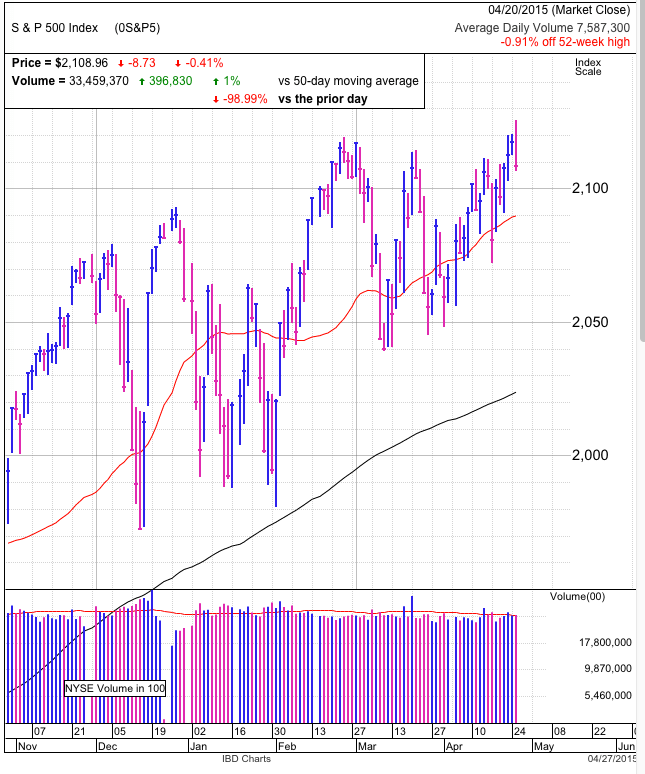 Bulls will continue being right in the near-term since prices are defying the skeptics. But over the longer-term, nervous traders will forget their fear as they see everyone on the other side making money. Once groupthink is the norm instead of the exception, then we will be ready for the next material correction. If you enjoyed this post, retweet it and/or sign up for free email alerts. Stocks gave up early gains and finished near the lows of the day. The daily chart leads one to conclude this is weak, bearish price-action. But the intraday chart tells a different story. Most of the selling occurred in the first couple hours of the day after the market hit its head on 2,110 resistance. But, following the initial 11-point slide, we largely trade sideways for the remainder of the day and closed only one-point under the lows hit at 10:30am. The intraday chart contradicts the daily because it shows supportive price-action as few owners joined the morning’s selloff. When the market is given a perfect invitation to selloff, yet hold firm, that is bullish price-action even if we finished in the red. While we cannot read too much into one day, it suggests the next few points will be higher. That is as far as this analysis can take us. We will have to reevaluate sentiment and price-action once the market tests prior highs near 2,120 before deciding to buy the breakout or sell the strength. If you enjoyed this post, sign up for free email alerts to notify you of future posts. 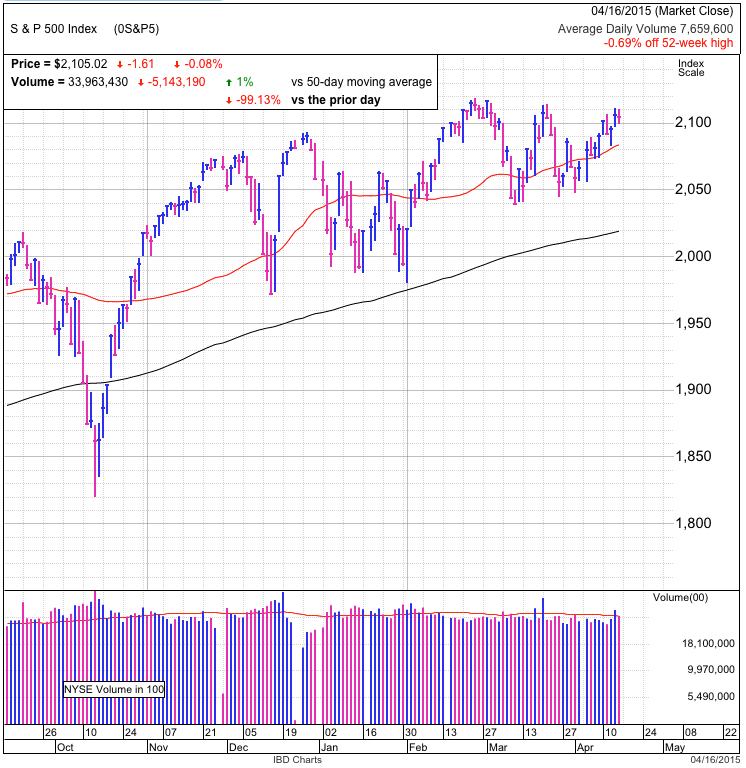 Stocks recovered from Friday’s selloff, reclaiming the psychologically important 50dma and 2,100 level. Volume was conspicuously absent, but by itself is not automatically a reason to doubt the rebound. Last week we crumbled as plunging overseas markets spilled over to our shores. Todays low-volume recovery shows the remaining owners are not concerned and we bounced as a lack of selling constrained the available supply. No matter what people think the market should do, the path of least resistance is higher when stubborn owners refuse to sell. It’s been a volatile but largely unproductive year. Buy-and-hold investors are up less than one percent, but by many measures they are the lucky ones. Any bull or bear coming to the market with an agenda is getting slaughtered buying strength or selling weakness. The only ones doing well are swing-traders betting against each move. The trading range for the year has been ~2,000 to ~2,100 and we’ve been stuck between ~2,050 and ~2,110 since February. Today’s move leaves us near the upper end of that trading range. There are only two things that can happen here. Either we blow through resistance and launch the next rally leg, or this up-move stalls and we remain stuck inside the trading range. 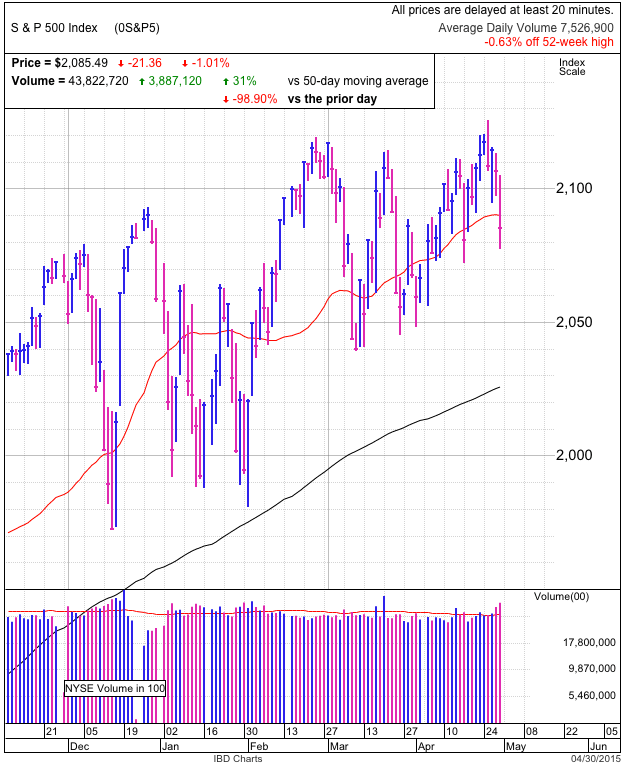 While it would be nice to see the market march higher, Friday’s dip did little to reset the bullish sentiment that is creeping into the market. The most profitable upside moves are born from pessimistic ashes. Today’s low-volume rebound tells us owners remain confident and optimistic. I’d much rather see pervasive gloom and doom before betting on another rally leg. While the bounce can push us back to old highs, this is most likely another selling opportunity, not a buyable breakout. If you enjoyed this post, please retweet it! The market closed short of all-time highs for a second day. Depending on your outlook, this is either pausing or stalling. Volume is finally making a comeback. Yesterday’s up-day occurred in enthusiastic trade while today’s modest dip hit the average mark, something that’s been hard to do recently. This shows traders are finally starting to pay attention. This week’s AAII investor sentiment survey mirrored the market’s gains and inched modestly in the bullish direction. The most interesting thing remains the heavy overweighting of neutrals. The historic average is 30%, yet we find ourselves over 45%. That tells us both bulls and bears are growing fatigued by this zigzagging trading range and giving up the fight. They’re not willing to change sides yet, but are far less confident in their outlook. Technically we find ourselves near the upper end of the trading range. Two previous attempts to break 2,120 failed. Will the third time be the charm? We should know in coming days. Either way this is an important turning point for the market. If we cannot break through, bulls will likely give up and it will be a rough summer. If we smash through resistance, the nearly four months of sideways trade this year built a solid foundation to launch the next leg of the rally. While many pundits and gurus claim to know what the market is going to do next, at this juncture it could go either way and we are best served following its lead. Buy the breakout or short the stumble. Stocks woke up to early gains, but stumbled into the close. Volume was even lighter than the below average trade we’ve gotten used to. That tells us few were changing their mind and buying or selling these early gains or late losses. Last week’s AAII Investor Sentiment survey shows an interesting result where the percentage of BOTH bulls and bears declined precipitously. That’s because both sides piled into the neutral outlook. It seems bulls have grown tired of being burned by false breakouts and bears are afraid of another breakdown rebounding in their face. We’ve been stuck between 2,040 and 2,120 for two-and-a-half months and it seems many traders are finally waking up to the realization that we don’t always go up or down. Of course the crowd giving up on a directional move means we might finally breakout out of this trading range. Technically we reclaimed 2,100 resistance Friday but were unable to hold it through Monday’s close. The lack of breakout buying and short-covering tells us most of this buying is already behind us and we could drift lower on weak demand. It shouldn’t surprise anyone to see us dip to 2,080. The real insight will come from how the market responds to this test of support. Is this just another pause before resuming the climb to all-time highs? Or will we slice through support and crash back down to the 200dma? We should either buy the dip or sell the weakness, but we won’t know the answer for a couple more days. Trade sideways in this area for the remainder of the week and that stability tells us it is okay to hold for higher prices. 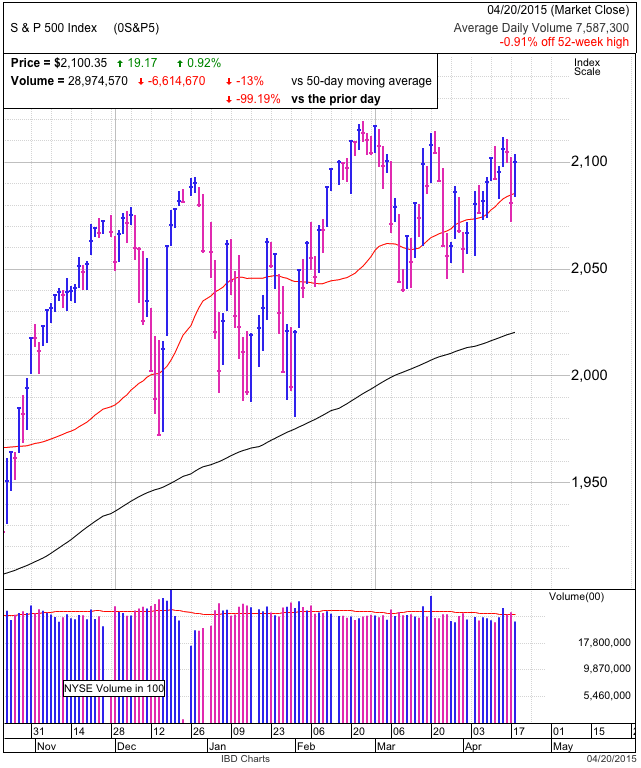 But if we crash through the 50dma and the selling shows no signs of letting up, then expect us to blow right past recent lows and continue to the 200dma at 2,020. Does the lousy Employment Report matter? Not if you go by Monday’s bullish response. Many traders were lucky the market was closed for Good Friday or else they would have mistakenly dumped the big miss in jobs. While pundits are spinning their “good is bad” doublespeak, the simple truth is we ran out of sellers. Recent weakness put a damper on enthusiasm and many owners bailed before the jobs report. When the selling occurs ahead of time, there isn’t much weakness left for when the disappointing news finally breaks. Given today’s strong move, this was a classic sell the rumor, buy the news trade. Many people complain the market is rigged, but they make the mistake of trading headlines. Those with a little more experience know only supply and demand drives prices. 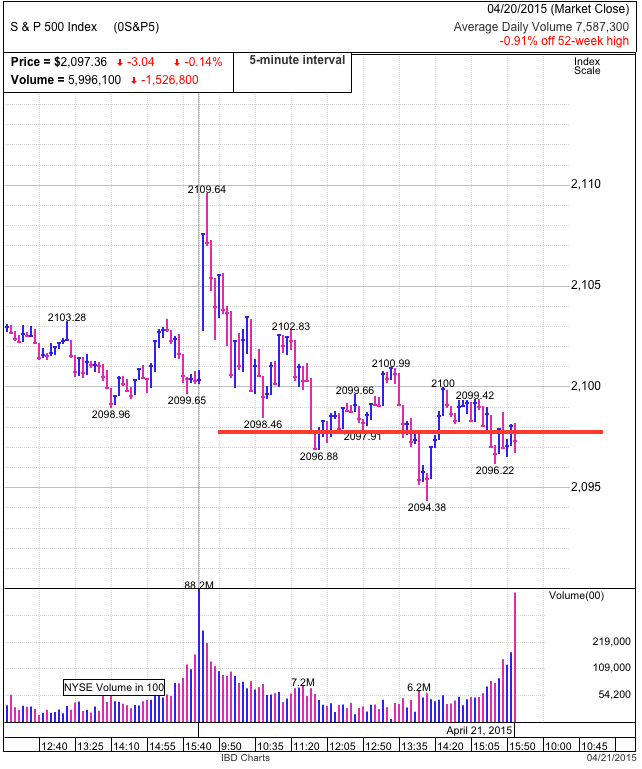 As I discussed in last week’s blog posts, we knew sentiment shifted heavily toward bears and prices slipped to the lower end of the 2,040-2,120 range. Even with a demoralizing miss in employment, there wasn’t a lot of downside left. That made buying ahead of employment an attractive risk/reward. 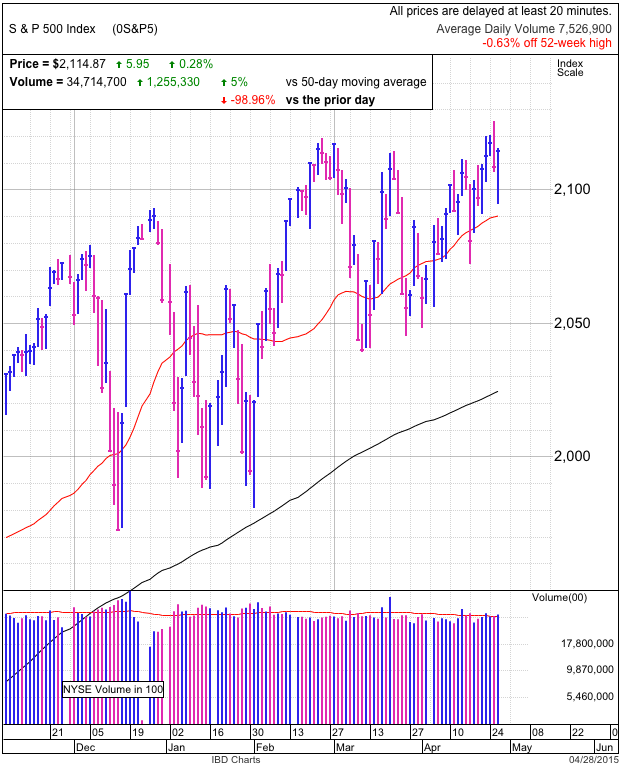 Over the near-term expect a short-squeeze to push us up to 2,100, but it doesn’t feel like this market has the momentum to finally break through 2,120 resistance. That means we are better served taking profits, not adding positions as we approach new highs.